Dr. Mary has training as an oculoplastic surgeon. She has been on the teaching staff at Rush University Hospital since 1981 in the area of oculoplastic surgery. Facial rejuvenation has become an important issue. Sometimes surgery is necessary to achieve the desired cosmetic effect and sometimes non-surgical intervention will be appropriate. 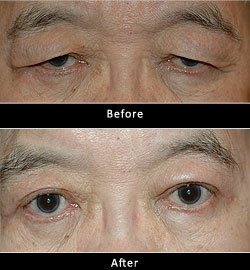 Blepharoplasty, brow lift, and ptosis repair are the most common of the surgical cosmetic procedures. Non-surgical intervention includes Botox®, Restylane®, Radiesse®, JUVÉDERM® Injectable Gel, Sculptra™, and many other injectables. Dr. Mary has used all the products extensively and has taught the procedure to other physicians. Dr. Mary will evaluate and determine which skillful course, whether surgical or non-surgical, will obtain the refined outcome. By removing excess fat, skin and muscle from the upper and lower eyelids, blepharoplasty can rejuvenate puffy, sagging or tired-looking eyes. It is typically a cosmetic procedure but can also improve vision by lifting droopy eyelids out of the patient's field of vision. Blepharoplasty cannot be used to raise the eyebrows or reduce the appearance of wrinkles, crow's feet or dark circles under the eyes, but the procedure can be combined with others such as a facelift and BOTOX® treatments to achieve these results. Read more. 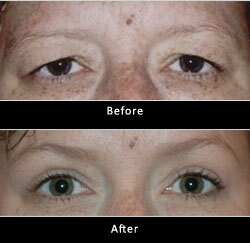 Brow Lifts can revitalize drooping or lined foreheads, helping you to look less angry, sad or tired. Using either traditional or minimally invasive (endoscopic) methods, Brow Lifts involve the removal or alteration of the muscles above the eyes to smooth lines and raise the eyebrows for a more youthful appearance. The procedure is often combined with other operations such as blepharoplasty (eyelid surgery) and facelifts to improve the look of the eyes and other areas of the face. While Brow Lifts are typically performed on patients aged 40-60 to counteract the effects of aging, anyone with lined or inelastic skin on the forehead – whether it's caused by muscle activity or inherited conditions – are eligible. The procedure is usually performed in an office-based facility or surgery center under local anesthesia and sedation. If you aren't sure whether you want a Brow Lift, try standing in front of a mirror and placing the palms of your hands to the sides of your eyes above the eyebrows. Then pull the skin back from the eyes, raising the forehead. This is approximately how the procedure will make you look. 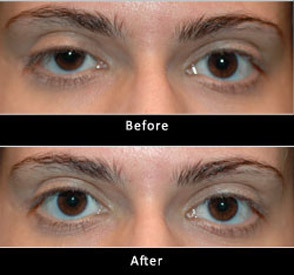 Brow Lifts may be performed in one of two ways: with conventional methods, in which the incision is hidden beneath the hairline (for patients with thinning or receding hair, who are bald or who have had previous surgery in the area, the incision will likely be moved somewhere less conspicuous); or with an endoscope, in which a tiny camera and instruments are inserted through a few small incisions. Both techniques produce similar results. We will discuss which option is better for you. Ptosis is a condition whereby the natural position of the upper eyelid is droopy or sagging and limits a person's field of vision. Ptosis caused by injury to the muscle, congenital defect, muscle disorders, nerve disorders, or aging can obstruct vision and/or create a tired or aged appearance. 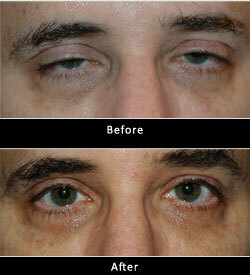 Correcting this problem involves surgery to repair the muscle and support the eyelid. The goal of reconstructive eyelid surgery is to correct deformities, improve function, remove tumors, and restore normalcy to the eyelid. Surgery may be used to restore eyelid function and correct eyelid ( Entropion Surgery and Ectropion Surgery ) deformities caused by physical trauma to the eye area, congenital or genetic traits or conditions that develop during the course of aging. A blocked tear duct (nasolacrimal duct obstruction) is a condition that most commonly results in chronic tearing (epiphora). It can also result in recurrent eye infections and occasionally, an abscess or a very serious infection of the tissues around the eye may occur. This condition can be diagnosed in the office with special testing and may be treated with a surgical procedure (Dacryocystorhinostomy). The goal of reconstructive eyelid surgery is to correct deformities, improve function, remove tumors, and restore normalcy to the eyelid. This surgery may be used to restore eyelid function and correct eyelid deformities caused by physical trauma to the eye area, congenital or genetic traits, or conditions that develop during the course of aging. 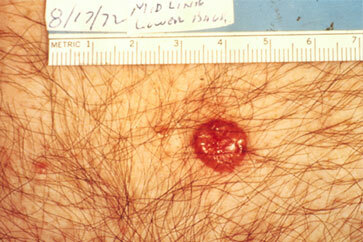 Small, reddish/brownish papule, often with telangiectatic blood vessels. May appear translucent, and when it is, described as "pearly" in color. May have a central depression with rolled borders.